When was the last time you walked into a bookstore, saw so many Indian Authors and wished that your name adorned a few of those books? When was the last time you wanted to write? Am sure for many of you, this would be a regular occurrence. Let me tell you an interesting incident, which happened yesterday, when I was at the Pune International Lit Fest, at a session moderated by Vinita Nangia. Tuhin Sinha and Madhuri Banerjee were the other two participants. In an auditorium packed to the hilt, with people squatting on the floor, in the aisles and even in the space between the dais and the front row, there were quite a few who wondered how to start writing. Their premise was that they wanted to write, but were not sure what to write about. In such a situation, it is always about the first step. The first push. It is the first few words that liberate you from your sense of inadequacy about your own writing. The problem with most of the want-to-be authors is that they are unable to focus. Either they have no idea of where to begin, or they have hundreds of ideas and don’t know which one to pick. Both scenarios leading to one result… they give up even before they start. This is where Write India comes to the fore. Conceived and curated by Vinita Nangia, a respected journalist and a bestselling author, Write India, brings together Eleven well known authors who have, over the years, established themselves in the field of commercial and literary fiction – Anita Nair, Chetan Bhagat, Amish, Preeti Shenoy, Ravinder Singh, Durjoy, Ashwin Sanghi, Jaishree Mishra, Madhuri Banerjee, Tuhin Sinha and yours truly (Ravi Subramanian) are a part of this initiative. Vinita Nangia recognised that when combined with the might of Times of India’s distribution, this ensemble of Authors could be a potent combination. A combination, which could inspire a generation to give writing a serious try. And this is what led to her giving shape to Write India. To participate one has to write a short story based around the passage. The only requirement is that the story must contain the passage in its entirety (beginning, end or somewhere in between doesn’t matter). One short story will be selected from the submissions made by readers, every month. 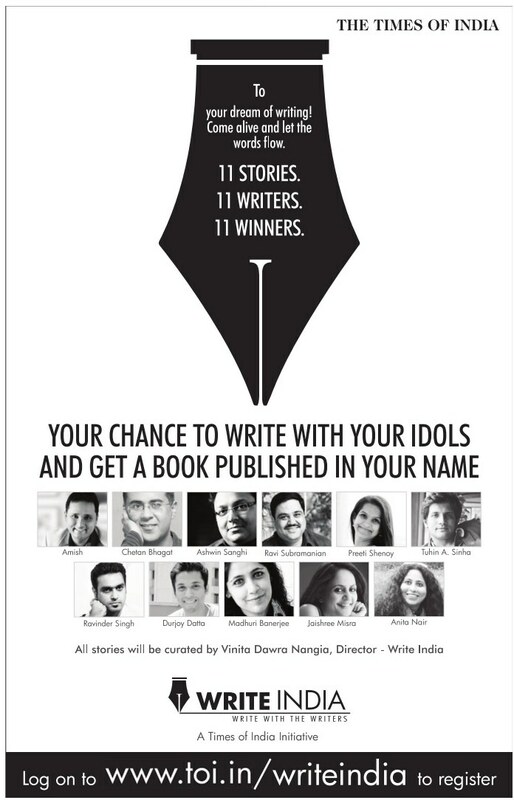 At the end of the campaign, Times of India will publish eleven best short stories thus selected in a book. Not only that, the eleven writers whose stories have been selected will also attend a unique writers camp in Diu wherein they will be mentored by some of the featured authors. There just cannot be a better chance than this for people to get published and learn from Authors who are willing and happy to share their experiences and knowledge. For those who don’t know what to write about, this effectively channelizes their thoughts and creativity in one direction and helps one make a beginning. It helps aspirational writers kick off their own insecurities and motivates them to pick up a pen and write. 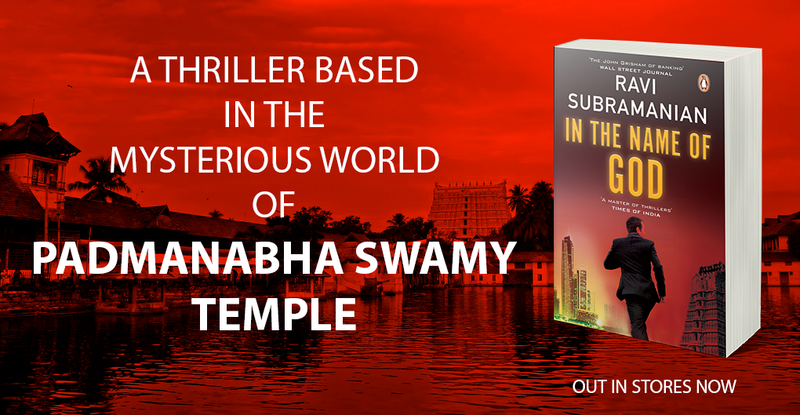 Write India, the way I look at it, provides you both the context and the motivation to start writing. After that it is only about your creativity and your will. It is about how intense is your desire to get published. Who would miss an opportunity to be cast in a project, which has the best of Indian writers in it? If writers like Amish, Chetan Bhagat etc. were a part of a project, would you miss an opportunity to be there? Would you ever let an opportunity to be a part of a program that brings to life the creative instincts of hundreds of thousands of Indians, pass by? As authors we know that it is very difficult to unleash ones creativity. A creativity that is so personal and latent. If you were given a choice to be a part of a team that inspires writers to write, would you ever let it pass? Obviously the answer is NO. There were many times in my initial days as a writer, when I had felt the need to talk to someone, to leverage on someone’s experience, to learn from someone who had written and published a book. But there weren’t too many forthcoming Indian authors around at that time. Vinita had come up with an excellent platform for youngsters to learn from established authors. Why would I ever pass an opportunity to do something, which as a struggling author I always wanted but could never get? The Diu writer’s camp at the end of the program will be worth its weight in gold. Now that all of us are in, I would implore everyone out there to go ahead and participate. It can work wonders to you, for your confidence and for your desire to be an author. Think about how awesome it would be to see your name on the book alongside the selected authors, whose books you have always read. And from what Vinita tells me (though she refuses to share exact figures with me) the number of entries they are getting is beating their own expectations…. that too by a mile. Isn’t it heartening to see that someone is getting whole of India to write? So if you are reading this and want to write – All I can say is …Go ahead and Write India… Write.